Like many of the fanciful tales of hauntings within the historic sites of the Old Town, a number of the tales of witchcraft and magic which have featured in the Stirling GhostWalk over the past quarter-century have their roots firmly planted in the history of the town. ‘Mad Bessie’ Stivenson and the sassy Magdalene Blair – both popular personalities in past shows – were real people. As with many of our tales, however, the myths and stories which have evolved around them are often very different from the cold hard facts...but no less fascinating, for all that. To modern eyes, most of those accused of concocting spells, rites and potions in past centuries were clearly not dabblers in the Dark Arts. Folk traditions, local superstitions and herbalism account for most cases. Paranoia, spite and a fear of society’s misfits or outcasts – those of different religions or who were afflicted by disability – cover the rest. Unsurprisingly the greatest concentration of accusations, trials and executions in Scottish history occurred between 1590 and 1680 - from the Union of Crowns, through the assassination of Charles I and Cromwellian Occupation, to the Restoration of the Monarchy – an unprecedented period of political and ideological tribulation. Hardly surprising anxiety, and fear of the ‘outsider’ dominated the populace. A crime against both the laws of God and State, it had the almost unique distinction of being tried by representatives of both, in turn. 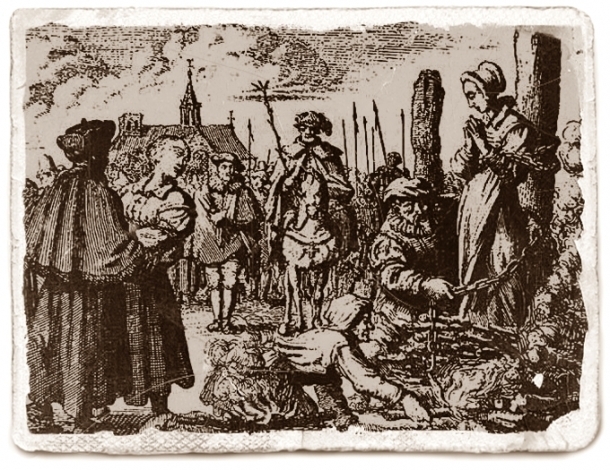 First of all those accused of witchcraft were brought to the attention of the Minister and Kirk Session, who would examine witnesses to establish whether the accused was guilty of malefic (or malicious) intent. The accused would then be detained, and tortured to secure a confession. Only when a confession had ‘proven’ that there was a case to answer would Stirling’s magistrates, the Baillies, sit in formal judgement. Most convictions resulted in hanging, strangulation, burning at the stake...or a combination of all three. Lesser charges of ‘Turning the Riddle’ (fortune telling) or ‘Charming’ – where there was no intent to cause harm through potions or curses – would in most cases result in a fine or Banishment from the community. Sadly, as we shall shortly see, this was not always the case. Witch trials were rare in Stirling, when compared to the rest of Scotland, and comparatively bloodless, too. This was not, of course, because our Baillies were soft hearted: they merely resented the expense of hiring a licensed torturer – known as a ‘Common Pricker’ – and of arranging public executions. These ‘Prickers’ took their name from their favoured method of ‘testing’ a witch. A ‘Bodkin’ – a long thin blade – would be heated in a brazier, then thrust into any mole, birthmark or blemish on the accused’s skin which might be taken as a ‘Devil’s Taint’. If they bled, they were mortal. If they didn’t, they were obviously enchanted. That the heated blade had cauterised the would and prevented bleeding never seems to have occurred to anyone. There is historical record of ‘Thumbikins’ or ‘Pilniewinks’, finger-vices tightened to crush the digits of the accused – being used to exact confessions in a handful of Stirling trials. The ‘Boote’, a device which achieved the same function when fixed around its victims' feet, may also have been used. There is no evidence, thankfully, of the water-torture of the ‘Ducking Stool’ being used here, nor of the ‘Cashielaws’, an iron cage fitted around the legs of the accused, allowing them to be raised, turned and toasted over a burning brazier. The first such device used in Scotland was the personal property of the witch-obsessed James VI - a gift from his father-in-law, Frederick II of Denmark, to mark the occasion of James’s marriage to his daughter, Anne. James personally participated in both the trial and torture of witches, and his 1597 book ‘On Daemonologie’ was effectively a guide-book for the would-be witchfinder, justifying their sadistic state-sanctioned practices. The paranoid monarch saw supernatural dangers in every shadow, persecuting an alleged coven in North Berwick for casting spells intended to sink the ship bringing him and his new bride home from Denmark. He had little patience with the Stirling Baillies reluctance to try and torture accused witches. In September 1597 he wrote to the Provost, demanding that they immediately despatch a ‘prickat witch’, then being held in the Tolbooth, for trial at his palace in Linlithgow. The fate of the unfortunate woman is not recorded, but it is unliely to have been pleasant. Young, attractive and sharp as a pin, Magdalene Blair was the very opposite of the image of the warty, wrinkled-crone we associate with 17th-century witches. In January 1659 she was accused of ‘malefic intent’ by her neighbour Helen Ker. Magdalene, she claimed, had used charms to kill another neighbour’s horse. After confronting her Ker returned home – only to discover a grotesque lump of flesh in the shape of a hand between the sheets of her bed. Soon afterwards she became ill. Blair may or may not have had a romance with Ker’s husband in the past. The physical and financial woes of local burgess John Steill, were attributed to Blair, though his motives in accusing her were suspect, to say the least: several testified on Magdalene’s behalf that the Burgess had ‘gotten a bairn with her and would give her nothing’ for its care. Another neighbour, Helen Ferguson, swore that she had been cursed for an ‘unkindnesse’ to Blair’s husband. William Luckison testified that Magdalene had offered to cure him of a sickness placed upon him by another witch, Isobel Bennet – a friend to both Mistress Ferguson and Helen Ker. Bennet was then also put on trial. Blair also implicated another healer, a simple-minded creature named Bessie Stivenson. Old and dishevelled, a near hermit, ‘Mad Bessie’ is every story-book’s image of the witch. A childish, superstitious mind and a talent for herbal healing were to be the undoing of this poor woman. Her testimony provides a fascinating insight into both her own peculiar imagination, and the folk traditions of the day. She gave account of fashioning charms from fragments of 'a horseshoe shed by a beast borne by fairies'. She told of anointing cripples with waters borne ‘from the hollows of the sea’, and of curing those who were ‘maw-turned’ (nauseous) by leading them in a merry dance around an oak tree. It’s generally held that once accused of witchcraft, the fate of the ‘witch’ was sealed. Many died during torture, or confessed simply to make their suffering end. Magdalene, though, cleverly played the system. She accused others known to deal in charms and potions, meaning that the only testimony against her – from Kerr, Ferguson and Steill – was seen as little more than circumstantial surmise or slanderous gossip. Isobel Bennet, convicted of ‘Charming’, was whipped through the streets and fined £20. Poor mad, harmless Bessie though, was burned at the stake, on 1st April 1659 – in the valley between Stirling Castle and the Holy Rude Church...a safe distance from the thatched rooves and wooden walls of the Old Town. Though there was clearly no malice in her, she had confessed - at great length and fantastic detail - of dealing with all manner of imps, spirits and fairies. The laws of the day demanded that she pay for her 'crimes' - the innocent victim of religious hysteria, public paranoia, and the tumult of accusation and counter-accusation which lies at the heart of most major witch-panics in our history. We might judge Magdalene harshly for implicating so guileless and inoffensive a creature, but to be fair the ‘Blair Witch’ really only did what she had to to survive during this most bloodthirsty of eras. 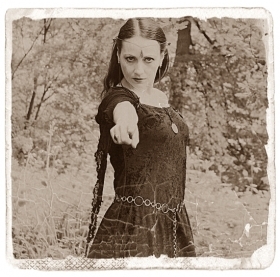 Storytelling tradition in Stirling in the intervening centuries has figured Magdalene as the true witch, who threatens to turn the tables on her torturers, and ‘Mad Bessie’ as a comic grotesque who is literally ‘away with the fairies’. Interestingly, most of the tales embroidered around their histories present them as genuine witches...though whether they thought themselves to truly be so is anyone's guess. 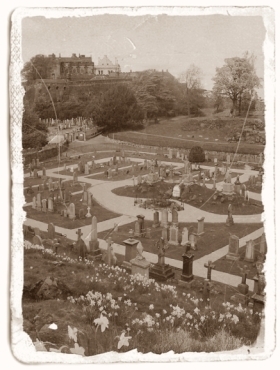 Versions of these tales can be found in our 'Tales From the Stirling ghostwalk' section! Truth, however, is often far stranger – and crueller – than any fictions we might dream up.